This immersive in-world guide based on the highly popular Supernatural television show reveals the strengths, weaknesses, secrets of the deadly ghosts, demons, angels, and creatures that the Winchesters have hunted. The Men of Letters were a secret society dedicated to accumulating knowledge of the supernatural and arcane mysteries. Years after the order was wiped out, Sam compiled the records of the supernatural entities discovered by the Men of Letters into one book, along with additions and annotations from the Winchesters informed by their time as hunters. 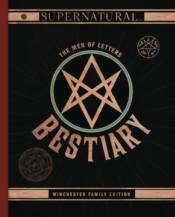 Complete with commentary from Dean and Castiel, Supernatural: The Men of Letters Bestiary offers a rare, immersive look at the creatures and spirits that inhabit the series.